Media stocks are on the move as a key player in the space makes an historic shift. In case you haven’t noticed, a lot of things are happening in the space. Walt Disney (DIS), first and foremost, plans to unveil its new streaming service after the closing bell this afternoon. Known as Disney+, the business will represent a major new frontier for a company that started with silent films in the 1920s. Analysts at Cowen and BMO upgraded DIS into the event, predicting its rich offering of movies and television stations will quickly draw crowds of new subscribers. The transformation in the company is so important that investors shrugged off a strong earnings report in February because all they cared about was the shift to streaming. Other companies in XLC have also been running. Cable-television company Discovery Communications (DISCA) is the best performer so far this month, followed by traditional broadcaster CBS (CBS). SPDR Communications Services ETF (XLC) with new highs for year and 200-day moving average. Facebook (FB) is the largest holding in the fund, weighted at more than 19 percent of assets. The social-media giant has also been pushing to new highs for the year after shaking off worries about privacy violations. (Advertisers haven’t jumped ship.) Can you believe it’s been more than a year since the Cambridge Analytica scandal? Facebook (FB): Everyone’s holding their breath to see if the social media giant can transition users to the much-hyped Stories format. Last earnings season suggested it can. Alphabet (GOOGL): The search giant is one of the less volatile names in the sector. Walt Disney (DIS): Can the Magic Kingdom become a streaming powerhouse? Stay tuned for more tonight! Activision Blizzard (ATVI): The video-game maker has yet to recover from the last year’s selloff. Investors are worried about a lack of new titles and competition from Fortnite. Comcast (CMCSA): The biggest U.S. cable operator and the world’s No. 2 media company behind DIS. It owns NBCUniversal. Netflix (NFLX) didn’t make the top five (it ranks #8), but it’s still a major company in XLC. It’s also the first member to report earnings, after the close next Tuesday, April 16. XLC only came into existence last June, making it the newest of State Street’s broad SPDR sector-tracking funds. Most of its members came from the Consumer Discretionary (XLY) and Technology (XLK) buckets. Notice how XLC is so new that its chart only started showing a 200-day moving average this month. Gray Television (GTN): The Atlanta-based company, focused on the U.S. heartland, just signed Greta Van Susteren. Sinclair Broadcast (SBGI): Like GTN, SBGI portrays itself as a key market for political-ad spending. New York Times (NYT): After years of struggles, the Gray Lady is one of the few legacy newspapers to successfully evolve into a digital subscription model. President Trump might bash them, but he also seems to be helping their business. 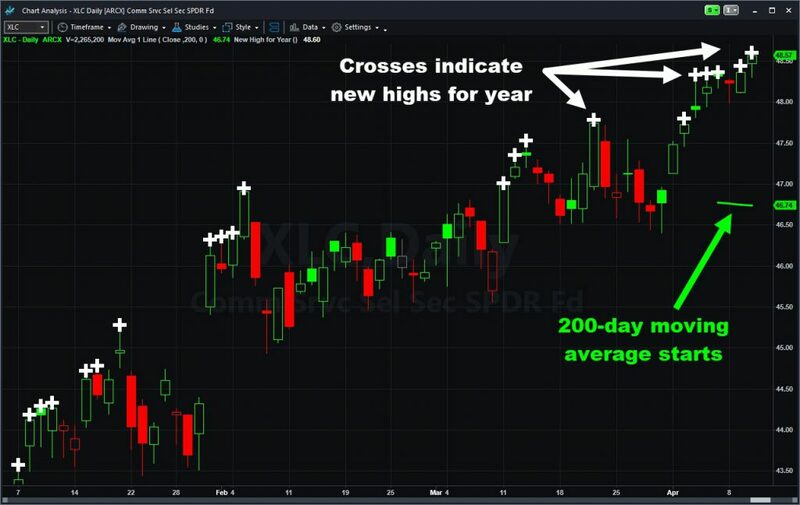 This article was written by David Russell, TradeStation Securities, Inc., part of the Monex Group Inc, published on 11/04/2019.